Christmas is quickly approaching, and if you are like me you still have a ton of stuff to do. So, with 9 days to go I know I don’t have time for a big project. This little holly leaf pattern is quick and easy, and the embellishing possibilities are endless. Use them to decorate your packages, add them to napkin rings to adorn your holiday table, pin one to your jacket to add a festive touch … the list goes on and on. And of course, I love when you share your photos of your finished projects with me. I can’t wait to hear all the original ideas you come up with! Click here for more free Christmas and Holiday patterns. Finished leaf measures approx. 4 in. x 2 in. Each row is worked facing front, do not turn. Round 1: Sl st in 2nd ch from hook, work *1 sc, 1 hdc, 1 sc, Sl st, repeat from * once more, ch 2, still facing front and working on opposite side of chain, Sl st in same st as last Sl st made, work **1 sc, 1 hdc, 1 sc, Sl st, repeat from ** once more — 20 sts. Round 2: Work [1 sc, ch 3, 1 sc] in the unworked beginning ch, work 1 sc in each of the next 2 sts, [1 sc, ch 3, 1 sc] in the next st, 1 sc, skip next st, 1 sc, [1 sc, ch 3, 1 sc] in the next st, 1 sc in each of the next 2 sts, still facing front, [1 sc, ch 3, 1 sc] in the ch-2 space from Round 1, work 1 sc in each of the next 2 sts, [1 sc, ch 3, 1 sc] in the next st, 1 sc, skip next st, 1 sc, [1 sc, ch 3, 1 sc] in the next st, 1 sc in each of the next 2 sts — 42 sts. Stem: Still facing front, Sl st in next ch-3 space, ch 5, Sl st in second ch from hook and each of the next 3 ch, Sl st in ch-3 space again to join. Do not start with a slip knot. Instead, make a loop with the skein end of the yarn over the tail end, and pull a loop through (counts as 1st ch). Ch 2. In second ch from hook, without completing last wrap, make 2 dc, yo and pull through 3 loops, Sl st in the same st to join, pull end of yarn to tighten into a ball. Fasten off leaving a long enough tail to sew the berry onto the holly leaf. Using a tapestry needle, sew berries to leaf. Weave in ends. Hi Cathy 🙂 You can find a button to print the pattern at the top of the post, directly under the post title. 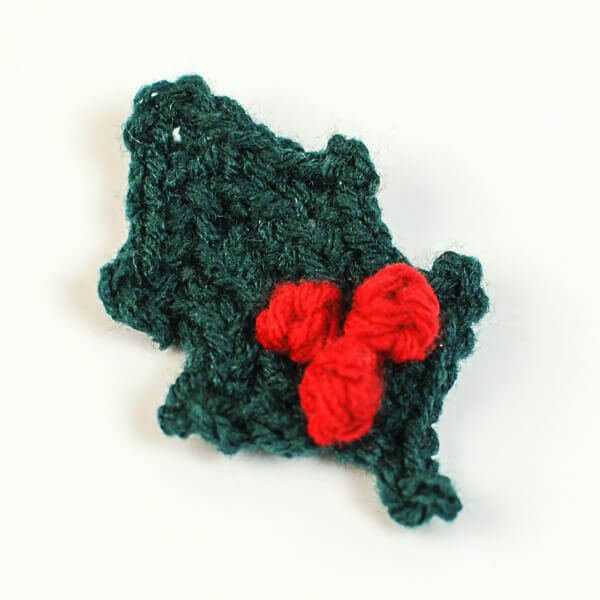 I LOVE these….a great crochet embellishment for a stocking, present, or a wreath! Cute blog! I’m now a follower from the Made in a Day Hop! I hope you will stop by Swanky Baby and follow us too! I just followed you w/GFC & liked your FB page. I’ve got 2 sites, hope you follow back. Just beautiful! I wish I hadn’t donated all of my moms knitting needles and tools after she passed. Sweet little holly leaf! Stopping by for the first time 🙂 Looking forward to perusing many of your posts!